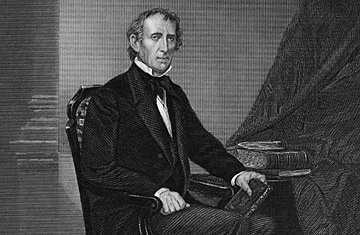 Detractors derided John Tyler, who in 1841 became America's 10th President after William Henry Harrison died just weeks into his first term, as "His Accidency." Whether or not Tyler deserved the snub, he was a total flop when it came to putting nominees on the bench. Throughout his term, Tyler's opponents repeatedly thwarted his judicial (and sometimes Cabinet) nominations. During a 15-month span in 1844-45, Tyler put forward five men for Supreme Court confirmation a total of nine times. (John C. Spencer, Reuben H. Walworth, and Edward King all had their nominations scuttled more than once, and the full Senate never acted on John Read's nomination.) Only one of the five, Samuel Nelson, was confirmed to the high court.